The weather here in the UK has suddenly become too hot – perfect temperature for me is about 20 degrees celsius, and today it has been 31. I’m literally melting and I don’t think I have sweated so much in my entire life. I am dreading the tube journey tomorrow. 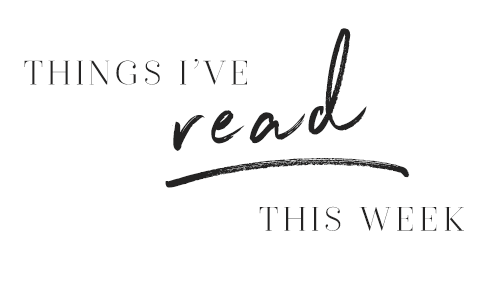 It’s a little sad that every week I’ve been writing my newsletter, something terrible has dominated the news. Sadly again this week there was another shocking accident in London, when Grenfell Tower caught fire and many residents perished. Hundreds of others found themselves homeless. When I came into work the morning after, you could look across to where the fire services were still working hard to put out the flames, hours later. I spent the day in shock, imagining what it must have been like, how they felt. I cried reading stories of mothers throwing their children out of windows to try and save them. The fallout has been just as heartbreaking as it turns out that the cladding used in a £10m renovation last year was not even fire-proof. If only people’s lives were worth more than the money saved by using a cheaper, poorer product. I don’t really want to talk too much about it as I still feel quite upset. London has responded amazingly though; donating money and clothing, and quite rightly asking why the government has failed to address buildings like Grenfall, where the fire risk has been continually raised by residents and ignored. I hope this means that the government and property developers can ensure that this kind of accident can be avoided in the future. All this early morning tweeting and whistling, and the fact that they just WON’T SHUT UP, has been making me tired, grumpy and irritable. Why won’t they just go back to bed?! And that in turn got me thinking: I’ve never seen a bird asleep. Where do they go? Do they have little nests? Do ducks sleep in trees? Do they snuggle? I can’t really get a decent answer on the last one, so let’s just assume that birds are super cuddly little dudes and you should definitely hug the next sparrow you see. I did a little bit of research, and it turns out that…bird sleep is AWESOME. I warn you – there may be more than one fact this week because our chirpy little friends are actually super cool. Interesting fact one: Most birds don’t actually sleep in nests. It turns out that once they’ve laid eggs in there, and the hungry chicks have grown up and left home, it’s a pretty stinky place to be; covered with bird poo (no, they don’t always aim for Uncle Jeff’s car or your shirt on interview day; they do sometimes poo in their own home too) and sometimes infested with mites. Sounds pretty minging. Instead, most birds find hedges and dense foliage, or bird houses, a cliff edge, or a small cave to sleep in. Generally they sleep off the ground, which is safer. Even wild turkeys roost in trees. (See this video!) So it isn’t really all that weird to imagine a partridge in a pear tree, really. Thanks Christmas. Thanks for not all being lies. Second interesting fact: Wading birds, and those that live on the water, just float into the middle of the water for an evening kip. Any disturbances on the water immediately wake them up, meaning they get advanced warning of any approaching predators. Smart move, but what if the wind blows you to the water’s edge whilst you’re asleep, and you get gobbled up by a passing fox? This is where a bird superpower known as unihemispheric slow-wave sleep comes in. Basically, this is a state where only half the brain is asleep, and one eye remains open and one half of the brain alert, meaning that they can respond very quickly to any immediate threat. They don’t always sleep like this; if a bird feels protected, it might drop into a deeper and more complete sleep. If it’s having a quick kip in the bush, it’s probably only half asleep. USWS is probably most useful to migrating birds, who literally sleep whilst they’re flying. Very little has really been scientifically studied, but it looks like swifts and albatrosses use this to fly so far in one stint. Which solves another mystery of how birds can fly so far without needed to stop. I feel like I need a little USWS in my life. These defensive strategies aren’t just used in sleeping. It also happens when flocking birds are awake, as seen in this viral video showing some turkeys circling a dead cat. Animal behaviourists have suggested that the turkeys perceive the cat to be a threat, and they are trying to intimidate with their numbers and prevent it from singling one out. It also has the added consequence of freaking out humans, which means the tactic works, right? Here's a little magic for you! And the holographic leather is so shiny, I'm kinda in the pic as well 😂 makers tagged! Dolly and Dotty is a relatively new brand on the pin-up scene, but they’ve got a fantastic range of items on the lower end of the scale, offering a range of prints in various styles. These styles often have cute names – this is the ‘Anna’ dress; I own a ‘Cindy’ and an ‘Annie’. Most of their dresses are lined, and of a nice quality, but sadly for me a little less than generous in the bosom department. That said, I’ve still got my eye on this navy/white striped ‘Anna’ – at £34.99 I’m not sure how long I can keep telling myself I just don’t need it. That striped skirt!! This style often sells out, so if it isn’t available in your size, you can always sign up to find out when it’s back in stock. This dress comes in UK sizes 8-24. Lady Vintage was the first company I bought from when I was making my first foray into 50s clothing, back in 2015. I love their tea dresses; cute shorter dresses with a v-back, and now – pockets!! I am so thrilled to see that pockets have been included in the newer styles, and I’m head-over-heels in love with the flamingo border print range from their SS17 line. This blue one has particularly taken my fancy, and I am gutted it is sold out in my size! 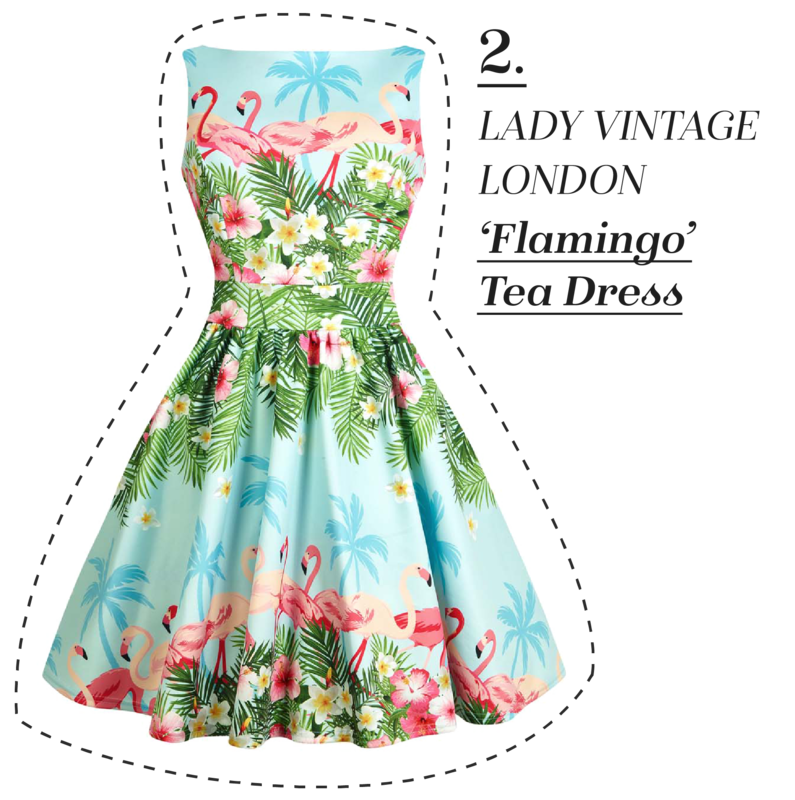 Here’s hoping there is a restock soon… The flamingo border print tea dress is £55 and comes in UK sizes 8-22. 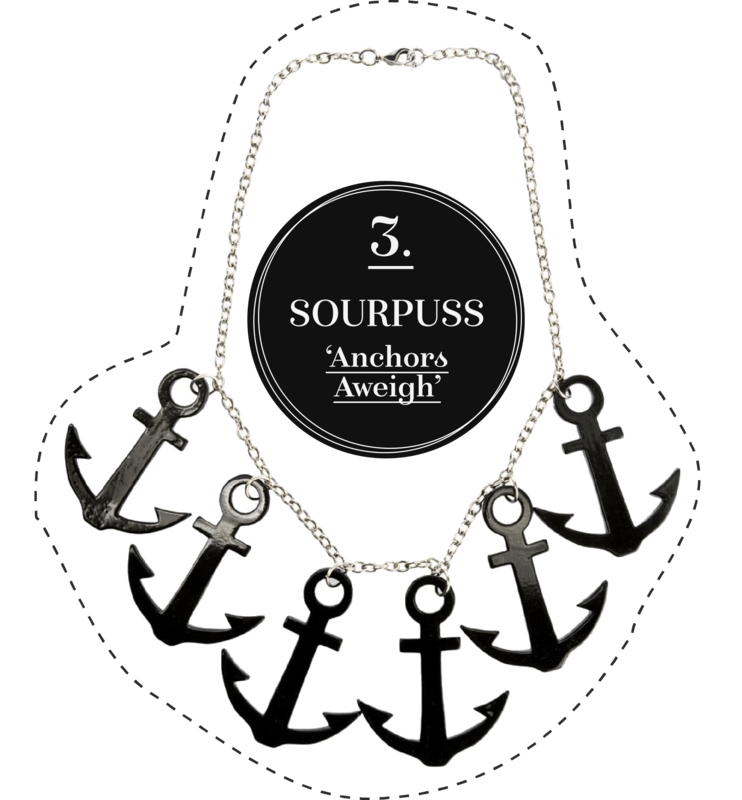 I love this chunky charm necklace from Sourpuss; a summery nautical design, but with a slightly gothy vibe! I love my acrylic jewellery, and for only £12 from Collectif Clothing, this is an absolute bargain. Is there anyone out there who doesn’t like the Wizard of Oz?! 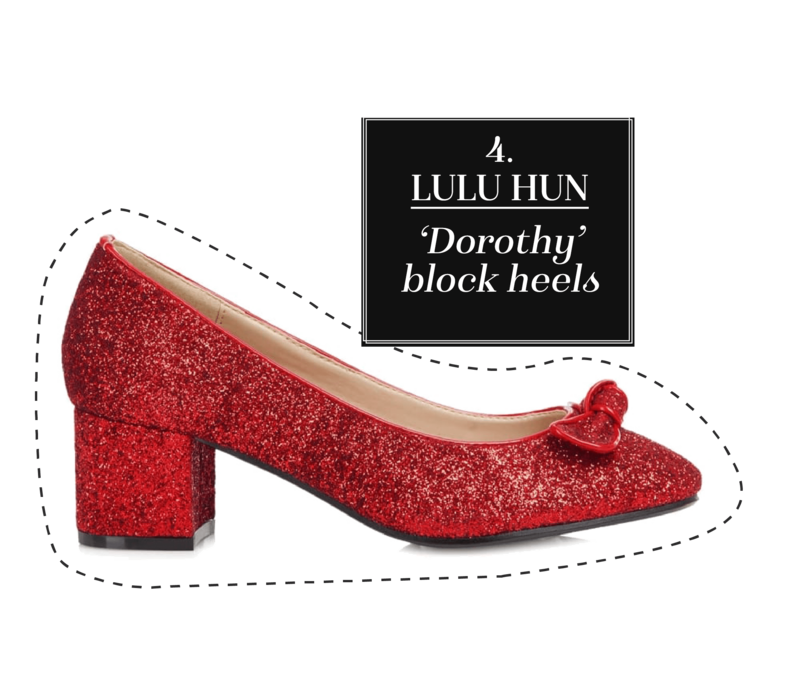 Even if you’re not a fan of the amazing West End performance, or the 1939 film, you MUST at least love the fact that it has introduced red glittery shoes into mainstream fashion? Lulu Hun’s shoes are a little small in sizing for me, so I always size up – which is why I am so annoyed I didn’t buy these beauties when I first saw them on the Collectif site as they have now sold out of my size! These really are selling fast, and as of writing only UK sizes 3 to 5 are available via Collectif currently priced at a mere £41.75. No, YOU are obsessed with dinosaurs. I can’t get over just how incredible this bag is! Origami? Mint? Dinosaur? In one perfect bag?? I KNOW, I KNOW. It’s still available from Thunder Egg, for a slightly pricey (but totally worth it) £39.95. 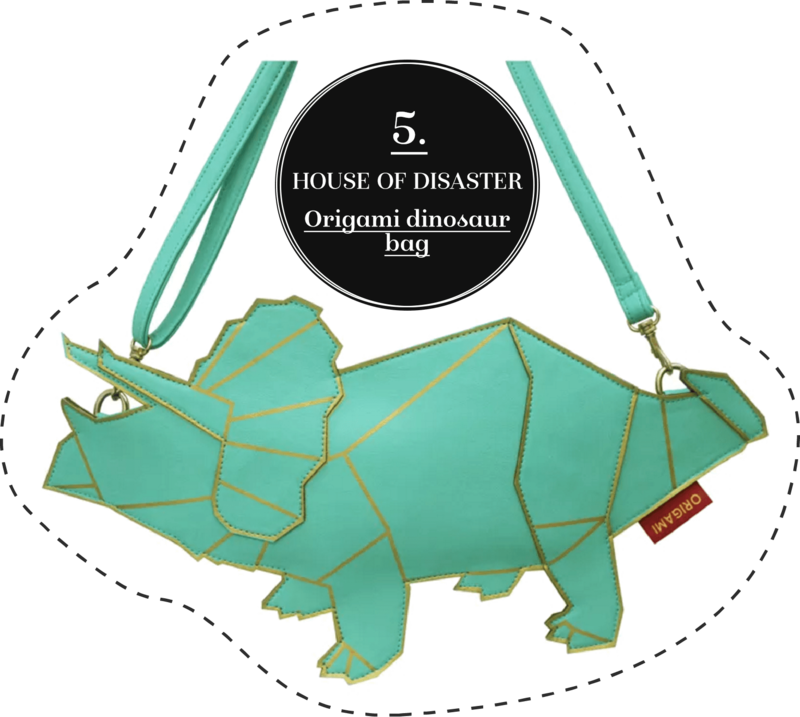 I just dino if I can hold myself back from buying it.